Hello to all my wonderful supporters! Beautiful? 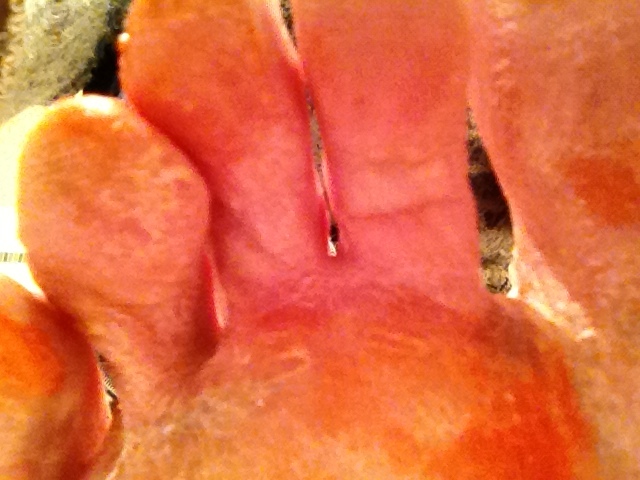 You can see the two drill holes where they released the pressure from blisters under the toenail after Stage 2 – lovely. …just to give you a small taster. I’m busy beginning to write up the race in full and will hopefully be able to post it here and on my website by the end of this week, with photos galore… (not all my photos as after being buried in a sanddune on Stage 2 my camera decided that it couldn’t cope with a second MDS and gave up the ghost). So to those of you who followed the race, a BIG THANK YOU TO YOU FOR YOUR SUPPORT, it meant absolutely everything to me from the ironically amusing jokes, to the philosophical whimsies which inspired me never to give up. Thank you all, they helped me laugh, cry and kept me running. I’ve survived a gruelling 150+ mile race across the Sahara Desert for the second time. All I can say is that it has been one hell of an experience from beginning to end. As fun, challenging, exciting, demanding and extraordinary as the first time, if not more so, in so many ways. I’ve made some very special friends. Not least, the seven lovely (if a tad smelly) men I shared a tent with for the last week. We’ve shed tears, laughter and a few unsavoury moments that will bind us together forever. And also with other participants who, at times I ran with who got me through, or I helped through low patches. The Tiyanjane Clinic has never been far from my mind, and was a wonderful source of inspiration when the going got tough. As were all the wonderful messages I recieved from so many of you willing me on… I can’t tell you how much those messages helped. Thank you! I am now clean and sand free, if hobbling a bit with rather bruised and battered feet. It remains to be seen how long my toenails cling on to my toes! As I sit enjoying the sun and a cold beer during a last afternoon in Morocco, I send my love and thanks to you all and will let you know in due course how much money I have raised. Cheers for now! Stage 5: Hello from the Sahara Desert for the last time! The first 10k were horrific for me. My feet were agony. Walking hurt. Running hurt and I pretty much stumbled over the line at CP1 and had a small meltdown bursting into tears on a very sympathetic doctor’s shoulder. She patched my left foot up gave me a painkiller and off I went. I was now at the back of the field with what looked like the walking wounded returning from some war. But, I found my mojo and set off, singing all the way. I caught up with four of my tent buddies at CP2 and then straight on to CP3 through some of the most beautiful dunes and wild scenery. I’m proud to say from CP1 onwards no one passed me. I don’t know why but despite my feet I felt fantastic and it was just amazing to be in the desert today. We started running at 8.30am and I finally crossed the finish line somewhere around 3am. It was a tough day… A case of power marching, the desert shuffle and a slightly delerious run. I will save the story of this stage for later as it had many twists and turns. I ran with lots of different people and had a lot of laughs and interesting moments – not least when stumbling out of CP5 into the dunes and falling headlong down one… Much to the amusement of the two French guys with me at that moment. I’m proud to say I ran in the dark on my own and didn’t get lost! I sang a lot, lost my voice, but the stars and moon were out and the desert was inspirational! Found the first 12 kilometres really tough, but then someone must’ve put something in my drink as I stormed up the hill from CP1 and down into a beautiful valley of dunes. Ran with a lovely 60+ Moroccan, Amine and had lots of laughs. A few toenails trying hard to part company with my toes, but other than that all good. Filthy and my hairstyle is something special – and would you believe it? Sand everywhere! There are some French firemen pulling disabled children along on a wheelchair. Watching them finish each day is something very unique. A bit of cloud cover to start with lulled us into a false sense of security and everyone was going ‘guns blazing’ to CP1. A lot of folk, tired from yesterday, began to slow up and the first real dune field reduced a lot of runners to walking. 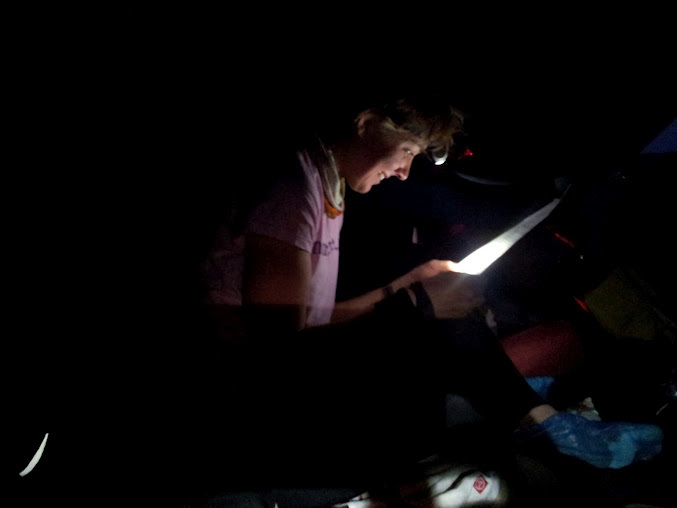 CP2 to CP3: Well that was something else… 6 miles across a flat, dry lake. It went on for ever and ever and EVER. Head down and just keep going. 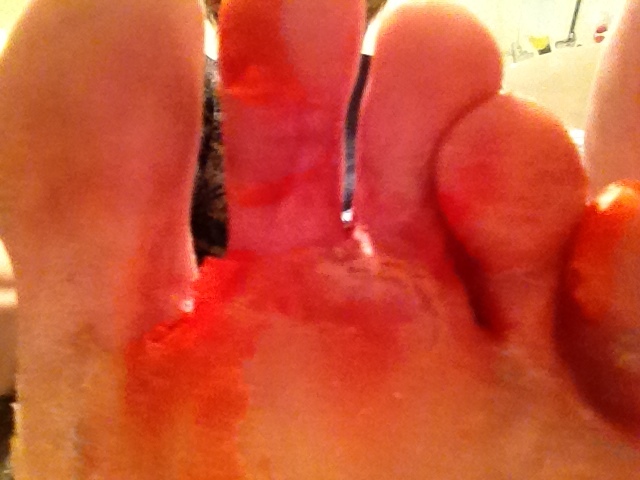 My feet felt like I had hot coals in them and at one point it felt like a blister exploded. (I have spent the last hour in “Doc Trotters” to have my feet mummified – all patched up for tomorrow). CP3 onwards: Beautiful dunes. I popped on my iPod and a mixture of David Guetta and Nina Simone saw me through. Pipped to the post by an Italian as we tried to outrun each other! GRRR! A new day tomorrow… Off to eat dried shepherd’s pie! Phew, that was something! 46 degrees apparently and it is going to get hotter!!! But what can I say: it is simply magical and awesome to be back here. I did it in about 5 hours. 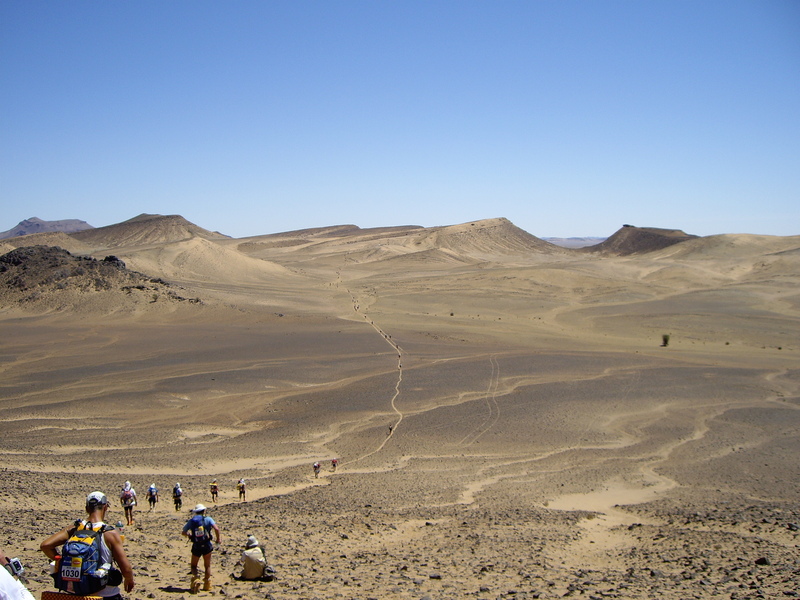 Someone put in a massively long hill right before the finish in the heat of the day which never ended and then the longest 3km to the bivouac – not sure who measured that one. It was a beautiful day though, stunning to run through the oueds and jebels, urged on by many beautiful (but dirty handed) children at points. I ran with some great folk at variuos points and was 4th into my tent just ahead of Sam (539). The competition is fierce at the front and also with the female Brits… I think just finishing in this heat is going to be an achievement. All toes intact and so far blister free.